Your company’s data center is an integral part of your business. By keeping it clean and organized, you are preventing structural problems from affecting your operations. 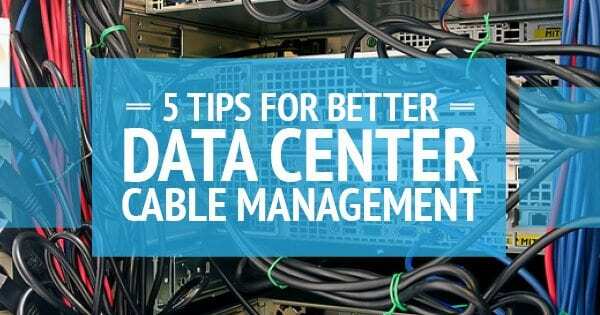 While air flow management and proper maintenance of your data racks are essential, it is also important to manage your cables. If your cables are tangled in disorganized heaps between your racks, it is time to get them in order. Follow these simple tips to keep your cables working as they should and to prevent maintenance headaches in the future. Place Cables Intentionally: Rather than tucking the cables wherever is convenient, be strategic in their placement. Depending on the exact layout of your server racks, you may choose to run the cables under the floor or above the racks. Decide which would be most efficient for you. Add Labels: By clearly labeling the cables on both ends, you are taking the guessing game out of deciding which cable pairs with which electronic device. This greatly reduces the probability of errors while also keeping everything organized. Measure Carefully: When configuring the data center, measure your wires and cables multiple times. You will minimize clutter by making their length precise. Perform A Test: When you are first building your data center, and periodically once it is running, be sure to perform a test on each cable. While it may sound tedious, this task will bring forward any errors from the beginning. Remember to be diligent to ensure that your cables are functioning at top efficiency. Include Cables In Design Plans: While creating the cold and hot aisle containment systems may be a top priority, integrating the necessary cables should also be high on your list. Include the location and organization of the cables in the overall design of the room to ensure that you have the necessary space set aside. A data center is a powerful hub for your business. In fact, one data center uses 100 times more power than a large commercial office building, and is equivalent to nine shopping centers the size of Walmart. Managing an operation of this size is a large undertaking, but by staying organized and efficient, you can manage your data racks with ease.